Our Retail Lobby Furniture is designed for mixing and matching to accommodate your lobby needs. Perfect for lobby updates, renovations or expansions, each piece can be used individually to add working surfaces, or combined with any or all of the other pieces to create a complete retail lobby system. 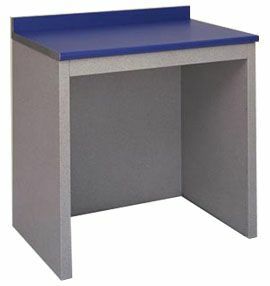 The HT Handicap Table is designed to attach to the HSS Industries Lobby Tables. Meets USPS retail color specifications. Perfect for any lobby updates or renovations.